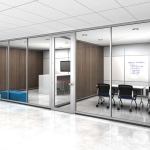 In the open-office work of collaboration and communication where most walls are coming down (not going up), movable walls, floor-to-ceiling, accommodate privacy needs and offer the flexibility to reconfigure tomorrow. Teaming and conference rooms, training areas and private offices can now comfortably and economically coexist with more open plans. The wall systems are installed as a furniture “turnkey” concept. Building an interior space in this way provides many benefits. Traditionally, drywall is constructed at the beginning of a project. Then the other trades are required to work around the walls already in place (e.g., electrical, network cabling, painting, carpet, cleaning, furniture, equipment, etc.). Scheduling and coordination of these sub contractors creates longer delays in building the project, at a higher cost. 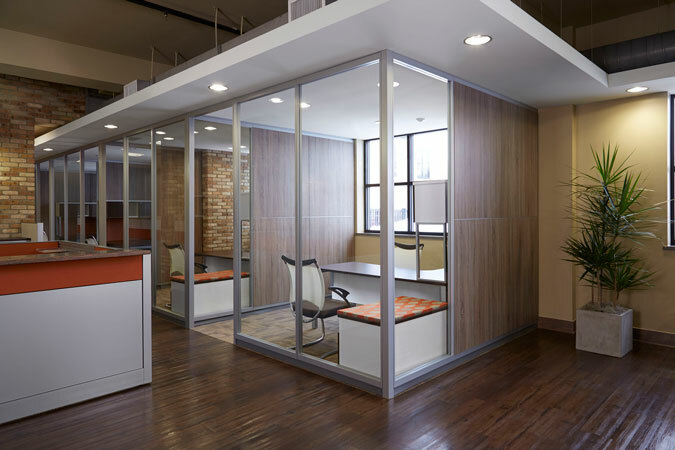 Movable walls reinvent this process by treating full-height walls like modular furniture. The building shell made up of electrical, cabling, suspended ceiling, carpet and perimeter finishing is executed in an open space without the presence of walls to obstruct the movement of tradesman and materials. Do you really need the flexibility of a movable wall? What’s the rationale for using movable walls? Do you really need and will you really use the flexibility these systems provide? Call us today for a free estimate and to see how we can help you with your movable wall systems using Trendway Products. When clients or customers arrive at your office, the lobby is their first encounter with your business or practice. This is the space where a first impression will begin, so it’s important to make it inviting. Here are a few excellent tips that will help transform your lobby into a luxurious waiting place that will make any guest feel at home. The first step is paint. When you’re picking our paint colors stick with colors that are more on the neutral side such as earth tones. However, don’t be afraid to use some color. Base your choices on the furniture and accent pieces you’ve already selected. Avoid light and dark extremes. White and off-white are too boring for this space. If you choose something too dark, the space will appear much smaller than it really is. 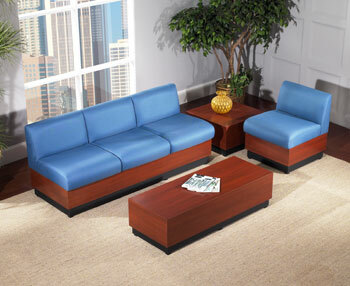 Select furniture for your lobby that is both attractive and comfortable. Since your guests may wait for a period of time, seating that will make them feel relaxed and at ease should be of utmost importance. Take into consideration how many clients or customers will be waiting at any given time and plan accordingly. Soft cozy chairs, settees or couches that are easy to clean and maintain are good choices. If you have a very large lobby, you may want to consider gang seating. Incorporate end tables and coffee tables where you can so that you can display magazines. You may also want to add a standing or wall mounted magazine rack. At Consolidated Office Systems, we can let you test chairs in your office before you make your final choice. Nobody wants to stare at a bare wall while they wait, so use artwork to add some color and flare to your lobby. Choose pieces that are interesting to look at, and be sure they are complimentary to the colors of the room and the upholstery of your furniture. If you find artwork that coordinates with the overall look of the room and stands out on its own at the same time, you’re on the right track. A nice way to welcome clients or customers that enter the lobby is to offer them a beverage while they wait. Set up a beverage station with coffee, tea, cups, spoons, napkins and small packets of sugar and creamer. You may want to think about either renting or purchasing a water cooler and cup dispenser as well. Make sure you have a water basket or two located close by for easy disposal. If your office lobby is a place children may be visiting, designate a special kid-zone just for them. A small table and chairs along with some toys with some toys, puzzles, coloring books and crayons will keep them entertained. Your office lobby should be a place where guests will want to return, so do your best to make it look and feel great. These decorating tips will help you create an atmosphere that your customers will love, adding to the overall success of your business.